finish: oxidized (darkened) or shiny, up to 32"/81cm. I have hand-sawed the initial pendant from sterling silver, and individually stamped each little star onto the front. I then went through a finishing process of filing, sanding, oxidizing, buffing, polishing, and lightly sanding the pendant, finishing it with a textured matte surface. The stars are oxidized (darkened) to show off their details. 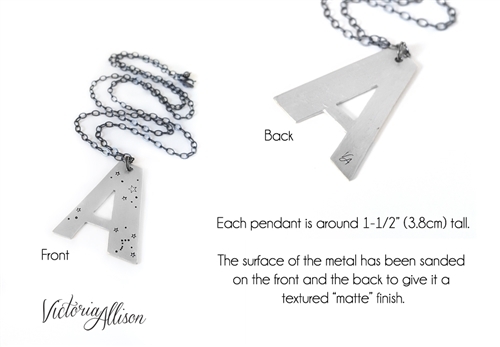 The pendant measures approximately 1 & 1/2-inches tall (3.8cm,) and the width varies based on the letter selected, but is always under 1 & 1/2-inches/3.8cm wide. 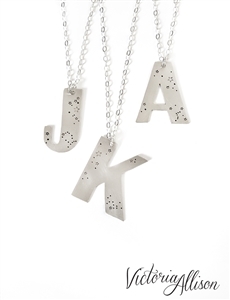 Each constellation - and the stars surrounding it - is hand stamped into the front surface of the pendant. I have oxidized (darkened) the stars to make them more visible. 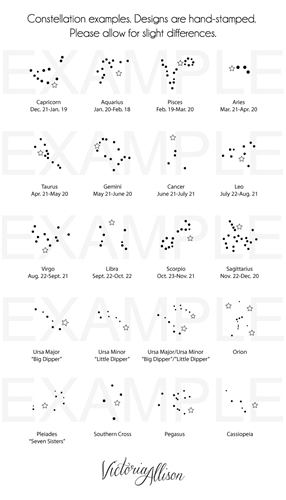 As I stamp each one individually, please allow for some subtle variations in the constellation. The additional stars on the pendant will vary from one to the next. Please view the listing images for visual examples of the style. Please view the 3rd image in the listing for examples of the chain finish and 2 of the length options. You may select a chain length between 18-inches (45.7cm) and 32-inches (81cm.) The chain is made of sterling silver, in your choice of finish: shiny, or oxidized (darkened). In the oxidized version, I lightly buff the chain in some places to make the edges a bit shiny. 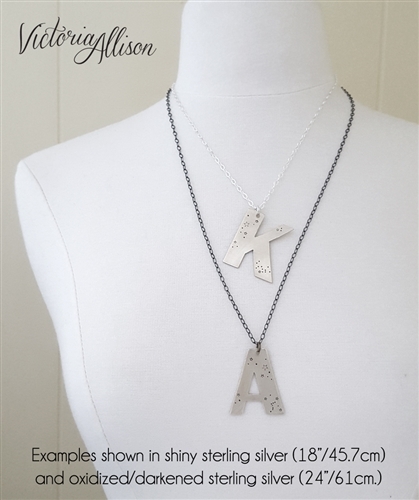 You can use a soft polishing pad/cloth [made for sterling silver jewelry] to make this piece more shiny if you wish. (Use lightly, as too much pressure may remove the oxidization color from inside the stars!) Please do note that sterling silver naturally oxidizes over time with exposure to air, perfumes, lotions, etc. I recommend keeping your jewelry dry and putting it on last when you're getting ready for the day.